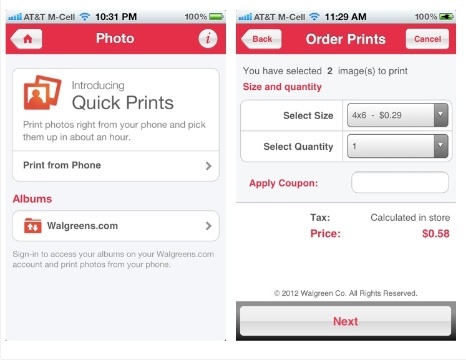 The Walgreens iOS app is superbly conceived, easy to use, attractive, and very useful. Need to renew a prescription? Scan the bar code on the bottle, and wait for the text message that it’s ready for pickup. Want some photos printed? Pull them out of the camera roll, click, then pick up the prints at the store. Can’t find the store? There’s a locator as well. The list goes on, and the app is amazing. The first thing you’ll notice is the clean, attractive home page with beautiful, intuitive icons. The value of a pure white background is an artistic concept lost on many designers. Next, the app is free, which is very smart. The app is a business promotion vehicle; there’s no need to charge. Unusually good design for a technical app. I have previously associated a phone number, good for text messages, with my local Walgreens store. 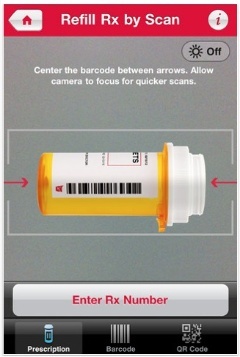 So, now, all I have to do is use the “Refill by Scan” function to scan the barcode on the prescription. Once recognized, and it does a great job, the refill order is sent back to the store from which I got the prescription, and that prescription number is tied to my account. Then the pharmacist refills the prescription (while I’m in my office writing), and then I get a text message telling me it’s ready for pickup. Unfortunately, I actually have to drive to the Walgreens store to pick it up. Kidding aside, this is a fantastic way to handle refills. No more standing around. Hold the bottle, aim the camera and click. Refilled. The next feature of note is the Photos function. Touch that, and you’re taken to the camera roll. Pick the photos you want printed (only five at a time) and they’re uploaded. Then just pick the format, quantity, store location and your contact info, and go pick up your photos. It’s painless and quick and so well conceived, it’s hard to imagine the process being any more iPhone (or iPad) friendly. Want prints for pickup? Select from cameral roll. Very easy. Got a shopping list? That’s easy to create. Want to select some coupons that might be valuable? Just touch one for display and let the cashier scan it off your iPhone at checkout. 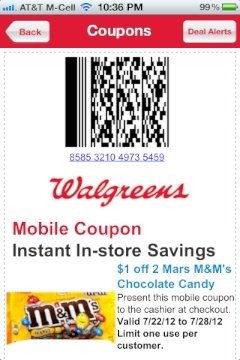 Scan the coupons at checkout. At this point in the exploration of the app, I was thinking, this is a beautiful integration of utility, marketing, infrastructure and iOS capabilities all rolled into a great app. And there’s more. There’s a pill Reminder for those who may need it. There’s a store locator that uses Google maps. If you create an account (and it’s not required to use all the above functions), you can look at your account history. You can even scan the label of a prescription obtained at another location, say, a grocery store, and transfer it to Walgreens. 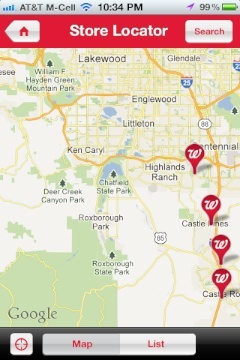 Location services helps find the nearest store. There are versions for the iPad, full screen (white icon), or the iPhone (red icon). They are compatible with any iOS device and iOS 4.3 or later is required. With enthusiasm. 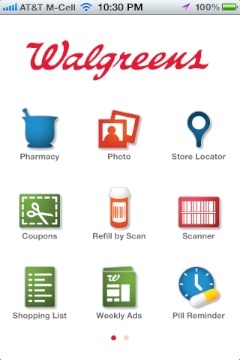 Not only is this app superbly written, easy to use, and incredibly useful, but it reminds the customer that Walgreens has built up a database and network infrastructure that makes using them a no-brainer. I have seen few grocery stores, so far, commit to that kind of pharmacy effort. Superbly conceived, easy to use, attractive and very useful. Free.